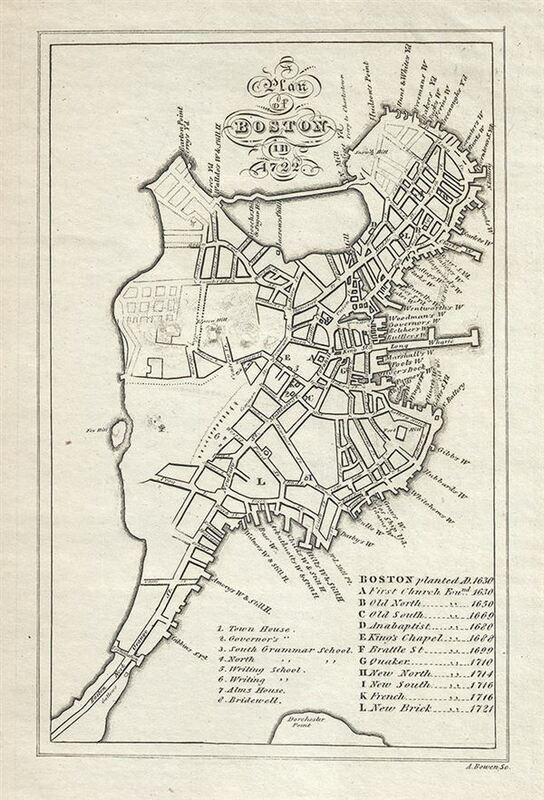 A Plan of Boston in 1722. This is a rare c.1820 map or plan of Boston in 1722 by Abel Bowen. It covers the city of Boston as it existed in 1722 from North End to Dorchester Point. Beautifully rendered in stupendous detail, it notes individual streets, wharfs, yards, hills and other topography. An index in the lower right quadrant notes 'Boston planted in AD 1630' with a list of churches corresponding to letters marked on the map. Important buildings identified with numbers that correspond to another key note the Town House, Governor's House, Schools, Alms House and Brideswell. This map was created by Abel Bowen. Very good. Original platemark visible. OCLC Number: ocn657202175. Wisconsin Historical Society: Historical Society Archives Map Collection, H GX8449 B74 1722 B78.